For what could be the first time ever, post-revolutionary Iran might not back out of competing against “Israel” in an international sporting event because of the serious damage that this stunt could do to its already strained relations with Russia if it refuses to play against its foe in the field medicine challenge that they’re both scheduled to participate in during the International Army Games that their shared partner is hosting. “The tank biathlon, one of the central parts of the games, saw the participation of 23 countries including Algeria, Egypt, Kuwait, Iran, Morocco, Syria and Sudan. Each team consists of 21 soldiers divided into four crews and tests the crews’ driving skills traversing over some 15 km. in the shortest time possible while firing at various targets such as models of other tanks, helicopters and rocket-propelled grenade-launcher crews. Not only is “Israel” poised to compete with Iran in what might be their first-ever post-1979 sporting event, but its military officials were also allowed to watch the Iranian tank crew carry out complicated maneuvers in real time. In addition, by an alphabetical coincidence, the two rivals’ flags were also posted next to each other. The symbolism behind all of this couldn’t be stronger because it shows that Russia is trying to bring these foes together as it attempts to manage their proxy war in Syria. Having confirmed the accuracy of The Jerusalem Post’s report, the question now becomes one of whether Iran will actually go through with the scheduled event and compete with its hated nemesis for what might be the first time ever since the 1979 Islamic Revolution. Iranian sportspeople always boycott participating in any kind of matches against “Israelis” because they believe that doing so grants legitimacy to the settler entity that their government doesn’t officially recognize, but this time they might actually go through with it for three reasons. The first is that the Iranians won’t necessarily be competing with the “Israelis” face-to-face because, as the author understands it, the individual and group runs are conducted separately from other teams, meaning that each goes through the course independently on their own and then just has their final times compared with everyone else’s. If that’s the case, then Iran might not consider that it’s “compromising” on its principled stance regarding the ethics of its sportspeople competing against “Israelis”, thereby making it acceptable to go ahead with the challenge. As for the second, Russian-Iranian relations are severely strained right now because of their unofficial but widely speculated disagreements about Syria’s post-Daesh future, which the author touched upon in his most recent article on the topic titled “It’s Official, ‘Israel’ Is Now A Joint Russian-American Protectorate”. Because “Russia Is Already ‘Balancing’ Iran In The Mideast”, Tehran is unlikely to want to cause a scene by dramatically pulling out of the field medicine challenge just to protest Tel Aviv’s participation in it and risk embarrassing Moscow to the point where it feels compelled to toughen its stance in order to “save face”. Finally, the last reason why Iran might be reluctant to drop out of that event is because it’s getting used to how Russia has gradually normalized indirect interactions between it and “Israel”. Not only is Moscow doing this on the military front in southwestern Syria, but it’s also quietly doing the same on the economic one through its plans to clinch Free Trade Agreements with both Iran and “Israel” and consequently serve as the commercial bridge between them, just like the author wrote earlier this year in his piece about how “The Resumption Of Russian-‘Israeli’ Free Trade Talks Proves Ties Are Fantastic”. Bearing these three points in mind, there’s a high likelihood that Iran will remain in the field medicine challenge and indirectly compete with “Israel” even though tensions between the two are at one of their highest points in history and they’re still engaged in a simmering proxy war against one another in Syria. 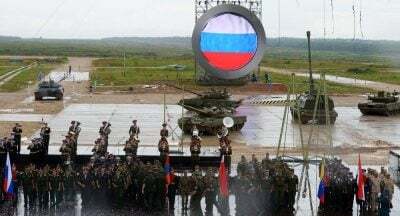 Russia’s symbolic “balancing” of both parties through what might be their successful participation in the same International Army Games event could bode well for regional stability, however, because it would prove that Moscow is capable of doing what had previously been written off as the politically impossible.